ILION hotel one of the 3-star Athens hotels, is located in the heart of the Historical and commercial centre, in Omonia square. Thanks to its location,Ilion Hotel constitutes the ideal choice for your stay, whether you are visiting Athens city for business or leisure. The omonia metro station just a few steps away, allows quick access to all major Athens sights and attractions. The Acropolis, the Acropolis Museum, the old town Plaka, the famous Flea market of Monastiraki, The Parliament are within walking distance from Ilion Hotel. The ILION Hotels is located within walking distance of the most important historical and cultural buildings, the Acropolis Museum, Archaeological Museum, the National Theater, The National Library, the University of Athens, the Parliament. From the Ilion hotel, you will be able to explore the Athens city, due to its easy access to all forms of public transport. The hotel has a wide variety of public services to offer its guests to visit the commercial city centre, the many stores or for varied night entertainment. You can take a taxi from the Airport (cost approximately 30 euro) or a bus, which will drive you downtown. From the Airport you can take the E94 bus (24 hours service) which goes to the nearest metro station "ETHNIKI AMINA" (Line 3). From there you will take the metro to "OMONIA" station. Our hotel is one block from there. You can take the E95 bus (24 hours service), which goes to "SYNTAGMA" square. From there you can take the metro to "OMONIA" station. Our hotel from OMONIA square is 2 minutes walk. You can take the metro (Line 3) from the airport to "SYNTAGMA" station. Then you take the metro line to Omonia and in the second stop (Omonia) you disembark. Our hotel from Omonia is 2 minutes walk. ILION hotel features 104 spacious guestrooms, all equipped with private bathroom, individually controlled air-conditionning, color TV, refrigerator, direct dial telephone and soundproof windows. The in-room facilities also include makeup mirror and bathroom toiletries. The hotel offers 14 specially designed family rooms. Our family rooms are composed of two connecting rooms ( two twin-bedded rooms or one twin-bedded room and one triple room) with common bathroom. Note: Non-smoking rooms are available. Our multi-lingual front-desk staff extending you a warm welcome in our reception area will gladly advise you on any aspect of your stay and provide you with any information you might need. 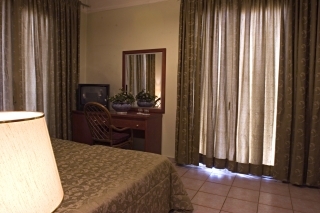 We are here to offer you a pleasant and comfortable stay. Located on the first floor, the lobby consists of a modern bar and a comfortable seating-room with 40’’LCD TV. The bar operating from morning till late evening is a nice choice for our guests to enjoy a coffee, a drink or a snack. Our guests can enjoy a rich hot American Buffet breakfast in the hospitable and calm environment of our breakfast room. A nice way to start their day. Είστε ιδιοκτήτης ή διευθυντής στο ILION; Εγγραφείτε τώρα για δωρεάν εργαλεία, που μπορείτε να χρησιμοποιήσετε για να βελτιώσετε την καταχώρησή σας και να συνδέσετε την ιστοσελίδα σας και το σύστημα κρατήσεών σας.